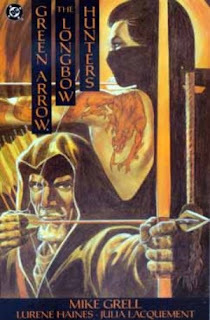 Given the recent controversy over Apple's apparent embargo of the digital edition of Mike Grell's Green Arrow: The Longbow Hunters, I thought this would be a good time for a review of that classic miniseries. For those following along at home, Longbow Hunters is to Green Arrow what Man of Steel was to Superman and Year One was to Batman -- the first major post-Crisis on Infinite Earths appearance of Green Arrow, re-establishing his post-Crisis origin. Unlike those stories, Longbow Hunters takes place in the present, just before the Millennium crossover, but Green Arrow's origin figures prominently in the first issue. And what an origin it is. It's been a while since I first read Longbow Hunters, and in that time I've read and liked a lot of other Green Arrow stories. Grell's Longbow Hunters is an Eisner Award-winning classic, don't get me wrong, and if you haven't read it, you absolutely should -- but I didn't much like Grell's origin of Green Arrow Oliver Queen. Grell would argue that Oliver wasn't much in danger when he was marooned on an island, and he did not so much defeat an entire gang of drug dealers as legend (and past continuity) had it, so much as two minor criminals tripped over themselves and Queen took the credit, dubbed accidentally "Green Arrow." I entirely understand that this goes to Grell's dual purposes of minimizing Oliver's superhero past and also giving the impression that Oliver's real serious life starts here -- Oliver the superhero dilettante versus the Yakuza assassin Shado trained to kill from birth -- but I rather like some triumph over adversity in my superhero origins, and Grell would argue that Oliver's has none. This is the start, however, of Grell's rather ingenious take on Green Arrow, one that I sincerely wonder if current audiences would accept. Oliver Queen is old here, just past his prime, and recognizing that his best days might have passed him by and he missed them. He very often misses the arrow-shots that he takes, and scolds himself for being slow -- there's probably not a character in the DC Universe more suited than its archer for the metaphor of being impotent. Oliver wants to settle down and have kids -- to domesticate -- and his girlfriend Black Canary Dinah Lance does not. In one particularly effective scene, Oliver stands naked in the window wondering where Dinah is, and then goes to bed alone. Grell plays with stereotypical gender roles here, especially in a superhero comic book, in a way that I imagine many writers wouldn't be comfortable. Oliver is still masculine, and his name is still on the masthead of the comic, but his actions and desires are those that you might otherwise see from the love interest in a story, and not from the protagonist. I don't have any additional issues of Grell's Green Arrow series that followed (wish I did -- where's that collection, DC? ), but editor Mike Gold suggests in his introduction to Longbow Hunters that the story continued to explore these and similar themes. Yet, Longbow Hunters, as the name implies, is in addition about breaking down some of these peaceful and superficially superheroic impulses in Oliver Queen, and replacing them with a hunter and predator. Oliver is continually unable to make his shots, but the one he lands, of course, instantly kills the man who's been torturing Dinah. Thus having loosed the chains of straight-and-narrow superheroism, Oliver ends up as the recipient of a fortune in drug money after Shado kills the dealers. A corrupt CIA agent sizes Oliver up, wondering if the vigilante's "occupation" can still be listed as hero -- the answer is, we know, not so much as when the story started. I've only read Justice League: Cry for Justice, and haven't yet decided if I want to pick up the widely-panned Justice League: Rise and Fall that follows the first book's events -- but I hope somewhere this latter book acknowledges the fact that Green Arrow killing the villain Prometheus is not so shocking as the rest of the Justice League (and the writers thereof) would have us believe. Oliver kills a bunch of non-super-powered street criminals in this book and -- let's face it -- he's a guy that shoots arrows. There's nothing wrong with the pacifist Green Arrow Connor Hawke approach, nor with a non-lethal boxing glove arrow once in a while, but inasmuch as I disfavor Grell's origin of Oliver Queen, I appreciate his more realistic approach to how a person with sharp objects would fight crime. And if I might offer one more push for a Green Arrow by Mike Grell Omnibus from DC Comics, Grell's artwork is absolutely stunning here. A page will have a number of standard full color panels, and then one large shadowy black and white image that serves, especially, to drive home the emotional moments between Oliver and Dinah. There's also one page where Oliver and Shado stare each other down, and Grell's image of Oliver's deep-set, masked eyes is just phenomenal. If not that, then I applaud DC for the big step of making Green Arrow: The Longbow Hunters available as a digital download the other week, and I hope maybe more Grell Green Arrow issues are set to follow in digital form -- hopefully without Apple interference this time. While I think GA: Year One is the superior origin story, Longbow Hunters remains a great read. I'm not fond of the halloween costume bit but the "old" Ollie makes things a lot more interesting. Its a dark but simple story that I love to read again and again. Having just downloaded the digital copies on sale for $0.99 each ($2.97 total! ), once I saw you posted this review I had to read them ahead of when I probably would have gotten around to it. I thought it was a great story. Much more simple (plot-wise) than I was expecting, given the reputation it has, but I felt the same way about Batman: Year One the first time I read it (as in, it was good, but different than what I was expecting - not that that's a bad thing). I really enjoyed the art as well. During the first issue I really noticed how many lines were used to convey a picture versus most modern artists, where the art tends to be very "clean." The backgrounds in particular were fantastic, of both the city, and the mountains in the third issue. I haven't read much Green Arrow, despite being very familiar with the character from Justice League (the comics and the TV show) - oh yeah, and the phenomenal Green Lantern/Green Arrow trades by Denny O'Neil. I did read "Quiver" and felt some of Kevin Smith's dialogue didn't quite work for me as far as I knew Oliver Queen. I much prefer Grell's interpretation here, and it seems closer to O'Neil's take. I've got GA: Year One in my pile to read, and it'll be interesting to see how the characters differ from this. If DC puts out digital issues of the follow-up series, I would definitely consider checking it out. I found it interesting, however, that Longbow Hunters fell under the "Green Arrow Volume 3" series in Comixology, which groups it together with the Kevin Smith/Brad Meltzer/Judd Winnick series. I want a Grell/Dixon GA volume 2 Omnibus so bad. It is pretty much my most wanted Omni. I enjoy this version of Ollie as I always thought of him as an elder statesman of the superhero community. That he was a bit older than the others (Even more so than Hal Jordan) this version of Green Arrow is very strong and you can often find the entire collection in individual issues on E-Bay for dirt cheap. (I found the entire run save for 5 issues for $1) Also given your love for Denny O' Neil and the Question there are usually crossovers with Vic Sage written in every annual or the annuals are written by O' Neil. Speaking of Denny O'Neil's Question, that series came out in TPB over the past 2-3 years. Any chance of a review, CE? Denny O'Neil's Question series is on my long shortlist of books to read and review; the Green Arrow connections aside, Greg Rucka references that Question series in enough of his own stories that I know I'll enjoy it. Haven't picked up Green Arrow: Year One (we had a guest review of it here some time ago). Is it pretty faithful to the established Green Arrow mythos? I believe this to be the better origin of Green Arrow, as compared to Year One. The successive issues didn't have art by Grell. Other people like Ed Hannigan handled the art while Grell did only the covers. The Question is great. My only complaint with the series is that it stopped short of the QUESTION QUARTERLY & does not contain the annuals. The 1st annuals of DETECTIVE COMICS, GREEN ARROW & THE QUESTION had a crossover called FABLES by Dennis O'Neil which I'd love to see collected. The vol 3 trade QUIVER by KEVIN SMITH is the best trade I could ask for considering the shout outs to all the DC appearances of GA, including this, GREEN LANTERN/GREEN ARROW, the whole v2 & even non GREEN ARROW titles like FINAL NIGHT, ZERO HOUR, SANDMAN & SPECTRE (V3, Hal Jordan) & STANLEY & HIS MONSTER. More than Zero Hour being tangentially connected to Sandman, I'd suppose this appearance makes SANDMAN a given in the mainstream DCU.